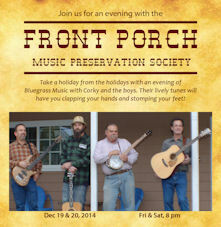 Join us for an evening with the Front Porch Music Preservation Society. Take a holiday from the holidays with an evening of Bluegrass music with Corky and the boys. Their lively tunes will have you clapping your hands and stomping feet. FPMPS is a bluegrass band rich in traditional bluegrass music, however they also offer up some not so traditional bluegrass music. Precision instrumentals mixed with great vocals and smooth harmony's makes for a performance everyone will enjoy.